Apple has published some excellent results in what is traditionally a slow quarter. 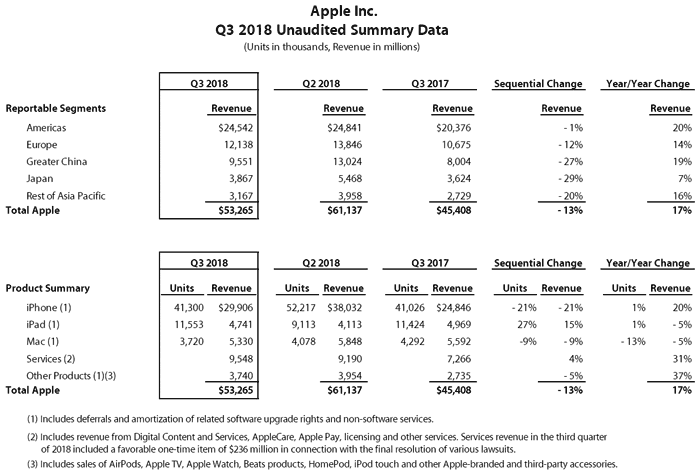 In its Q3 2018 results Apple posted revenue of $53.3 billion, an increase of 17 per cent from the year-ago quarter, and quarterly earnings per diluted share of $2.34, up 40 per cent (both figures beating estimates). In afterhours trading Apple shares were up to nearly $200, and it could very soon become the USA's first trillion dollar company. "We're thrilled to report Apple's best June quarter ever, and our fourth consecutive quarter of double-digit revenue growth," said Tim Cook, Apple's CEO. Cook commented that strong sales of iPhone, Services and Wearables were behind these excellent results. The WSJ provided some more details on the strength of the iPhone, in particular. It reported that sales of the smartphones usually weaken as new devices are expected in September but the demand, particularly for the higher priced iPhone X, 8 and 8 Plus has remained consistent. Apple's move to raise iPhone average selling prices seems to have paid off over the quarter ending in June 2018 (yes, this is Apple's third financial quarter). The WSJ notes that revenue from sales of the company's flagship product rose 20 per cent to $29.91 billion, even as shipments rose less than 1 per cent to 41.3 million units in total. iPad shipments were up 1 per cent year-on-year but revenues down 5 per cent year-on-year. Mac computer unit sales were down 13 per cent year-on-year, and revenues down 5 per cent. Apple Services (apps, cloud, pay etc) revenue was up 31 per cent year-on-year. Other products (headphones, Watch, Smart Home, accessories) revenue was up 37 per cent year-on-year. I've spotted a couple of other Apple related news nuggets today that are worth mentioning. 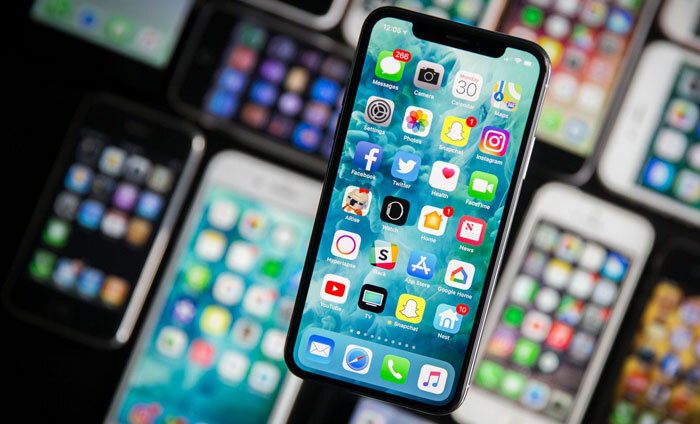 With Apple iOS 12 on the way there are signs in the code that Apple is readying the operating system for dual-SIM iPhones. Looking at the industry overall, CNN reports that Huawei has knocked Apple from the second spot for smartphone shipments. The Chinese firm sold 54 million phones in the last quarter (up 40 per cent) while Samsung sold 70 million units (down 10 per cent year-on-year). General question - how do people justify the cost of an £800+ phone (and this doesn't just apply to iphones)? I know by ‘buying’ via a sim contract it spreads the monthly cost to ~£50 but I still feel a little crazy having spent £300 on my current phone (and £5 a month on a SIM) and I earn a good Dev wage. I'm actually expecting my next phone to cost closer to £200 because I'm just not seeing new functionality I want let alone need… Am I just an out of touch 37 year old? General question - how do people justify the cost of an £800+ phone (and this doesn't just apply to iphones)? I'm 26 and bought my current phone for 70£, a Xiaomi Redmi 4X that was on sale. I can easily afford better ones but I just don't need the functionality and can't justify spending all that cash. The only thing I'd buy an expensive phone for is the camera, coz great cameras are only found on the flagships, but since taking selfies/photos as well as posting them on social media isn't really my thing, my 75£ phone is more than sufficient for me. Yeah you're an out of touch 37 year old (don't worry I'm the same sort of age) :P. Basically it's a status symbol for a lot of people, no idea why when so many people can buy them. As to apple having a $1 trillion value… maybe it's me but I'd be a little more insecure about my companies valuation when it basically relies on 1 item (lets be honest it's not the rest of their line up making them money)… we all saw how quickly blackberry and nokia etc went from being popular to nothing when the next big thing popped up. Look subjectively at Apple and not just at their existing brand status or marketing and you'll see that in real terms the only thing they're managing to keep ‘popular’ is the iPhone, designers are not as happy with Apple as they used to be, their iPad isn't selling as well and as many keep saying desktop/laptops for the home user are becoming less popular.